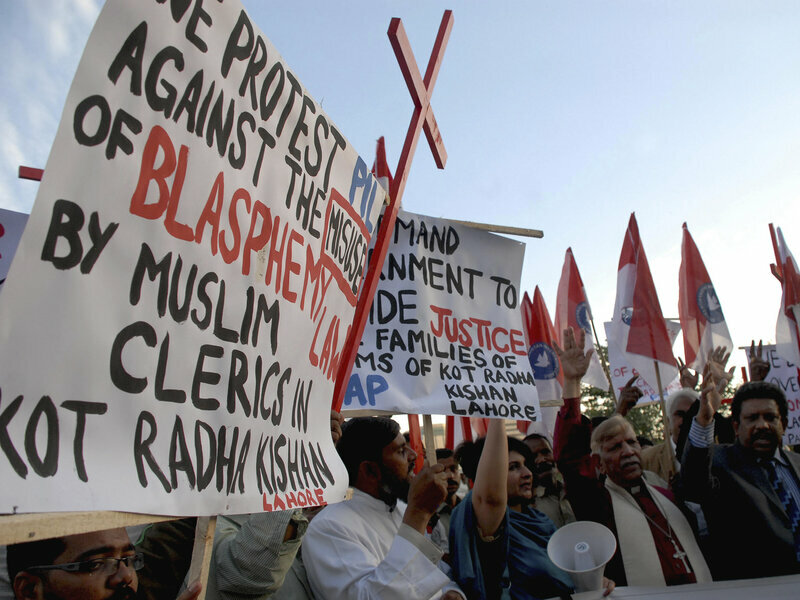 Pakistani human rights activists condemn the killing of the Christian couple for alleged blasphemy during a demonstration in Islamabad, Pakistan, in November. Prosecutors in Pakistan's Punjab province have charged 106 people in connection with the gruesome mob killing of a Christian couple who were incinerated in a brick kiln for allegedly desecrating a copy of the Quran. In November, Sajjad Mesih and his wife, Shama — who was pregnant when the couple in their 20s was killed — were beaten and thrown into the kiln they tended as laborers. "The accusations against them began after burned pages of the Quran were said to have been found in their trash. ... [As] word spread, the couple were locked up in a room adjacent to the brick kiln by their employer, Yousaf Gujjar, who also had a running dispute with the couple over money. Some accounts in local news media suggested that Mr. Gujjar accused them of blasphemy after they refused to repay money he had lent them. "Meanwhile, local clerics made incendiary announcements and urged people to gather. Hundreds of people converged on the couple's home, and witnesses said some in the crowd broke down the door and dragged the couple out. The police said they were tortured and then burned in the kiln." The BBC adds: "The case raised fears among Christians, who form a minority in the Muslim country where blasphemy laws are controversial and attacks against Christians are common. At the time of the incident, the Dawn daily wrote: "Pakistan's brick kiln workers are often subject to harsh practices, with a study by the Bonded Labour Liberation Front Pakistan estimating that 4.5 million are indentured labourers."